The over 30-year series of events wherein the famous oratorios of music literature are year after year performed by hundreds of amateur singers, assisted by Budapest Academic Choral Society and Dohnányi Orchestra, Budafok in Müpa’s Bartók Béla National Concert Hall is attached to Gábor Hollerung’s name. 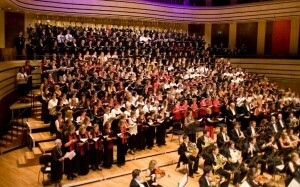 The joint concert by secondary school students from Budapest was first organized in 1985 and grew to become a national event from 2006, under the name Let the Country Sing. The event series Let the Country Sing offers the most various aged and skilled singers to participate from whatever segment of the country. The choirs and singers taking part in the project can perform grandiose oratories that they could not otherwise sing. All the participants attend a music camp held in annually changing provincial towns before the concert. The concept of the choir camp is focused on the dissemination of specific knowledge, considering that the rehearsals are not concentrated on learning the notes only, but also widen the participants’ awareness about the interpretation of the work, about styles, musical language, relationship between life and art. Altogether a thousand singers, including over two hundred Hungarians and foreigners from beyond the country borders, performed in the two concerts held on the thirtieth anniversary of the series Let the Country Sing, in the frames of Budapest International Choir Festival in 2015.